Nancy Pelosi, the first woman Speaker of the U.S. House of Representatives arrived in Italy on Saturday, February 14, for a six-day visit. The first stop was at the Aviano Air Base. She was accompanied by seven other members of Congress, all Democrats, many of whom are of Italian descent like her. She met with Italian leaders, the Pope, and also visited troops in Naples. On Sunday she visited museums in Florence and paid tribute to Americans killed in Italy during World War II in a ceremony at the Anglo-American war cemetery outside the city. On Monday Pelosi met President Giorgio Napolitano, and in the afternoon she held a conference at the Chamber of Deputies entitled Strong Allies for a Secure Future. There, she said that the U.S. administration is committed to a “new era of cooperation” with its allies. She met with the Italian Chamber of Deputies Speaker Gianfranco Fini who gave her a surprise gift: the birth certificates of her grandparents. “We know how proud you are of your Italian roots,” said Fini as he handed her the certificates of Pelosi’s Abruzzo-born grandfather and her Liguria-born grandmother. On Tuesday she had lunch with Premier Silvio Berlusconi who once again confirmed the strong connection between Italy and the U.S. and said that “we can emerge from this crisis by working together.” Later Ms. Pelosi met Foreign Minister Franco Frattini. At a dinner at Hotel Eden in Rome, Frattini stated that Italy-U.S. relations are based on “friendship and trust” between the two nations, their governments, and institutions. He also expressed the “commitment of the Italian government to cooperating even more closely with the United States,” through NATO in areas such as Afghanistan, as well as Africa which is “increasingly important for our government.” Frattini told Pelosi that “if Italy can do something, you can count on its support.” Pelosi replied that Rome and Washington “must reinforce their ties and work together” to confront global challenges such as the economic crisis, climate change, and security. Pelosi also met Defense Minister Ignazio La Russa who stated that Italy plans to increase its troops in Afghanistan in response to a call from the United States. 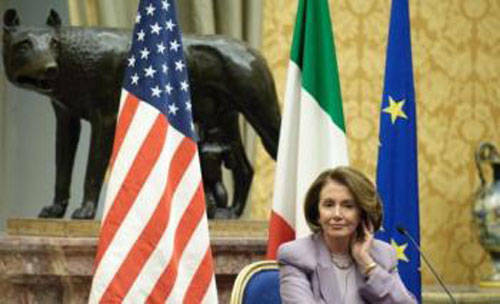 On Wednesday Pelosi had a short audience with Pope Benedict XVI. She was the highest-ranking US official to see the Pope since President Barack Obama took office last month, and the meeting was seen as significant since the new Democratic administration is at odds with the Vatican over abortion, stem cell research, and other bio-ethical issues. In a statement, the Vatican said that Benedict XVI “briefly greeted” Ms. Pelosi and her entourage after his weekly public audience and “took the opportunity to discuss the requirements of natural moral law and the church’s consistent teaching on the dignity of human life from conception to natural death.” The Pope added that all Catholics, “especially legislators, jurists, and those responsible for the common good of society,” should “work in cooperation with all men and women of good will in creating a just system of laws capable of protecting human life at all stages of its development.” Apparently this was a clear message to Ms. Pelosi who, despite her declaration of being an “ardent” Catholic, is a well-known supporter of abortion rights. Naples was the last stop where Pelosi met with U.S. servicemen and women stationed in the area. It was a hectic trip that did not leave room for any personal time. Gossip columnists, though, report that Pelosi made a special appointment with a famous hairdresser in Rome, Fabrizio Narducci, who privately opened his beauty salon on Via Sistina for the illustrious guest. The night before, Narducci received a call from the U.S. Embassy to schedule an early-morning appointment for the next day. After the customary inspection by secret service agents, the car arrived with Nancy Pelosi accompanied by Lila Castellaneta, the wife of the Italian ambassador to the U.S. After almost an hour of down-time at the hairdresser when she momentarily became a “normal” woman who wished to have her hair shampooed and set, Pelosi returned to her role as the Speaker of the U.S. House of Representatives, ready to dive into the usual and exhausting series of bureaucratic meetings.